Over the past several years, I’ve often proclaimed (probably to the point of being annoying) that I have the best job in the world — one that lets me do what I love from the comfort of my own home. But, as we all know, the things we love to do sometimes change as we discover new opportunities and recognize new needs. That’s what’s happened for me. I still love writing great marketing content, but I noticed something important: There are a lot of competent writers out there, but most of them see their jobs as writing what their clients ask for. Which is great if the clients are asking for the right things. But I’ve worked with a lot of folks who knew they needed content, but not what kind of content would best drive their business goals. Some of them were publishing content that was great on its own merits, but it didn’t really serve a purpose other than being content. Meanwhile,larger companies were hiring agencies to manage every aspect of their content strategy. But there was a big gaping hole when it came to experienced content strategists willing to work on an as-needed basis, even if that meant a one-time phone call. I strongly believe there are a lot of people out there, especially solopreneurs and SMBs, who just want to ask a few questions without signing a contract or buying a subscription. In fact, I know there are, because I’ve been there myself on a number of occasions, especially when attempting things like website migration. 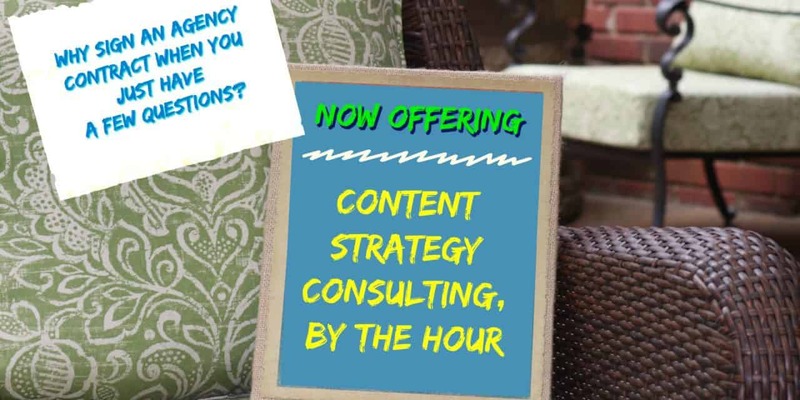 So I’m shifting my business in that direction: content strategy consulting when you need it, charged at an hourly rate so that you don’t pay for more than you need. You can read more about it on my services page. In the meantime, my blog posts offer some insight into the kind of guidance I give. So please let me know if I can help in any way. NextWhat exactly does a content strategist do, anyway?